Procon Technology now offers these value-for-money OEM or embedded PSUs (Power Supply Units), SMPS (Switched Mode Power Supplies) and Mains Adapters (Battery Eliminators) for medical, ITE and other applications. Please see prices below and email us regarding your quantity requirements or special application. OEM, wholesale or trade discounts are available. Meanwell, also provide industrial power supplies from 15W to 10000W, mains power adapters from 12W to 280W, Battery Chargers (including UPS), DC-DC Converters, DC-AC Inverters and LED Power Supplies! Due to their potentially life-saving nature the design and integration of medical-grade power supplies into medical equipment poses a real challenge. Meanwell engineers understand the particular medical compliance requirements and responded to the burgeoning medical apparatus market. The Meanwell range offers a wide variety of medical-approved power solutions to fit most applications ranging in power from 5 watts to 1000 watts in voltages from 3.3V to 48V. The MPS and RPS models also have dual (MPD, RPD), triple (MPT, RPT) output and Quad output (MPQ). Whether you choose the economical open frame power supplies, high wattage metal caged versions or totally enclosed mains adapters, all models are fully approved and carry safety certifications for UL/EN60601-1 safety standards. For eco-friendliness the PM, NFM, EPS, RPS, MSP and GSM ranges provide low power under no load conditions (i.e. stand-by conditions). With low EMC emissions, the RPS range is also recommended for use in Information Technology Equipment (ITE). The GSM range is the first power supply/adapter from Meanwell to allow input voltages of 90VAC or 120VDC (with 20% output derating). Like the GST range, they also provide extended temperature operation and a 3 year warranty. .....................4000W, remote on/off, DC OK, Aux. 5V@0.3A $540.00 $594.00 new! 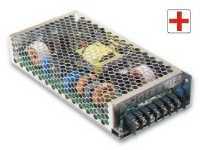 NMP1K2, 1200W 6slot 5V, 12V, 24V, 48V p.o.a. p.o.a. .
MPM-05-v, 5W module v = 3.3V, 5V, 12V, 15V, 24V $40.00 $44.00 new! MPM-10-v, 10W module v = 3.3V, 5V, 12V, 15V, 24V $45.00 $49.50 . MPM-15-v, 15W module v = 3.3V, 5V, 12V, 15V, 24V $50.00 $55.00 . MPM-20-v, 20W module v = 3.3V, 5V, 12V, 15V, 24V $54.00 $59.40 . MPM-30-vn, 30W module v = 3.3V,5V,12V,15V,24V,48V, n = b, ST $60.00 $66.00 . PM-05-v, 5W module v = 3.3V, 5V, 12V, 15V, 24V................... pdf $27.00 $29.70 . PM-10-v, 10W module v = 3.3V, 5V, 12V, 15V, 24V $33.00 $36.30 . PM-15-v, 15W module v = 3.3V, 5V, 12V, 15V, 24V $36.00 $39.60 . PM-20-v, 20W module v = 3.3V, 5V, 12V, 15V, 24V $45.00 $49.50 . MFM-05-v, 5W pcb v = 3.3V, 5V, 12V, 15V, 24V $36.00 $39.60 new! MFM-10-v, 10W pcb v = 3.3V, 5V, 12V, 15V, 24V $40.00 $44.00 . MFM-15-v, 15W pcb v = 3.3V, 5V, 12V, 15V, 24V $45.00 $49.50 . MFM-20-v, 20W pcb v = 3.3V, 5V, 12V, 15V, 24V $50.00 $55.00 . MFM-30-v, 30W pcb v = 3.3V,5V,12V,15V,24V,48V $54.00 $59.40 . NFM-05-v, 5W pcb v = 3.3V, 5V, 12V, 15V, 24V...................... pdf $25.00 $27.50 . NFM-10-v, 10W pcb v = 3.3V, 5V, 12V, 15V, 24V $27.00 $29.70 . NFM-15-v, 15W pcb v = 3.3V, 5V, 12V, 15V, 24V $33.00 $36.30 . NFM-20-v, 20W pcb v = 3.3V, 5V, 12V, 15V, 24V $40.00 $44.00 . RPS-45-v, 45W pcb v = 3.3V, 5V, 7.5V, 12V, 15V, 24V, 48V $40.00 $44.00 . RPS-60-v, 60W pcb v = 3.3V, 5V, 12V, 15V, 24V, 48V $45.00 $49.50 . RPD-60-v, 60W pcb v = 5V & 12V or 5V & 24V $50.00 $55.00 . RPT-60-v, 60W pcb v = +/-5V, +/-12V, +/-15V $50.00 $55.00 . RPS-65-v, 65W pcb v = 3.3V, 5V, 7.5V, 12V, 15V, 24V, 48V $50.00 $55.00 . RPS-75-v, 75W pcb v = 3.3V, 5V, 12V, 15V, 24V, 36V, 48V $60.00 $66.00 . RPD-75-v, 75W pcb v = 5V & 12V or 5V & 24V $70.00 $77.00 . RPT-75-v, 75W pcb v = +3.3V, +/-5V, +/-12V, +/-15V, +24V $72.00 $79.20 . RPS-120-v, 120W pcb v = 12V, 15V, 24V, 27V, 48V $70.00 $77.00 . RPS-200-v, 200W pcb v = 12V, 15V, 24V, 27V, 48V... 12V fan aux $120.00 $132.00 . RPS-300-v, 300W pcb v = 12, 15, 24, 27, 48V... 12V fan aux + on/off $180.00 $198.00 . RPS-400-v, 400W pcb v = 12V, 15V, 24V, 27V, 36V, 48V... + extras $200.00 $220.00 . RPS-500-v, 500W pcb v = 12, 15, 18, 24, 27, 36, 48V... + extras . . u.d. MPQ-200n, 200W pcb v = +/-5V. +/-12V, +/-15V, +24V $180.00 $198.00 . GEM12I-v, 12W SMPS v = 5,7.5,9,12,15,18,24,48V $40.00 $44.00 . GEM40I-v, 40W SMPS v = 5, 9, 12, 15, 18, 24, 48V $70.00 $77.00 . GSM90A-v, 90W SMPS v = 12V, 15V, 19V, 24V, 48V $80.00 $88.00 . GSM120A-v, 120W SMPS v = 12V, 15V, 20V, 24V, 48V $120.00 $132.00 . GSM160A-v, 160W SMPS v = 12V, 15V, 20V, 24V, 48V $150.00 $165.00 . GSM220A-v, 220W SMPS v = 12V, 15V, 20V, 24V, 48V $200.00 $220.00 . IRM-02-vn, 2W module v = 3.3V, 5V, 9V, 12V, 15V, 24V, n = b, S $20.00 $22.00 m.o.q. IRM-10-v, 10W module v = 3.3V, 5V, 12V, 15V, 24V $30.00 $33.00 . IRM-15-v, 15W module v = 3.3V, 5V, 12V, 15V, 24V $36.00 $39.60 . IRM-20-v, 20W module v = 3.3V, 5V, 12V, 15V, 24V $40.00 $44.00 . EPS-15-v, 15W pcb v = 3.3, 5, 7.5, 12, 15, 24, 27, 36V, 48V $30.00 $33.00 m.o.q. EPS-25-v, 25W pcb v = 3.3, 5, 7.5, 12, 15, 24, 27, 36V, 48V $40.00 $44.00 m.o.q. EPS-35-v, 35W pcb v = 3.3, 5, 7.5, 12, 15, 24, 27, 36V, 48V $45.00 $49.50 m.o.q. EPS-45-v, 45W pcb v = 3.3, 5, 7.5, 12, 15, 24, 36V, 48V $50.00 $55.00 m.o.q. EPS-45S-v, 45W pcb v = 3.3, 5, 7.5, 12, 15, 24, 48V... see IRM-45 $50.00 $55.00 m.o.q. EPS-65-v, 65W pcb v = 3.3, 5, 7.5, 12, 15, 24, 36V, 48V $50.00 $55.00 m.o.q. EPS-65S-v, 65W pcb v = 3.3, 5, 7.5, 12, 15, 24, 48V... see IRM-60 $50.00 $55.00 m.o.q. LPS-50-v, 50W pcb v = 3.3V, 5V, 12V, 15V, 24V, 48V............... pdf $50.00 $55.00 . LPS-75-v, 75W pcb v = 3.3V, 5V, 12V, 15V, 24V, 48V $60.00 $66.00 . ELP-75-v-C, 75W pcb v = 3.3, 5, 12, 15, 24, 36, 48V... with cover $90.00 $99.00 . LPS-100-v, 100W pcb v = 3.3, 5, 7.5, 12, 13.5, 15, 24, 27, 48V $80.00 $88.00 . 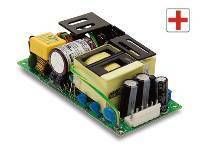 LPP-100-v, 100W pcb v = 3.3, 5, 7.5, 12, 13.5, 15, 24, 27, 48V... pdf $90.00 $99.00 . EPP-100-v, 100W pcb v = 12V, 15V, 24V, 27V, 48V $100.00 $110.00 . EPS-120-v, 120W pcb v = 12, 15, 24, 36V, 48V $100.00 $110.00 . PPS-125-v, 125W pcb v = 3.3, 5, 12, 13.5, 15, 24, 27, 48V $100.00 $110.00 . LPP-150-v, 150W pcb v = 3.3, 5, 7.5, 12, 13.5, 15, 24, 27, 48V $80.00 $88.00 . ASP-150-v, 150W pcb v = 12V, 15V, 20V, 24V, 48V $140.00 $154.00 . EPP-150-v, 150W pcb v = 12V, 15V, 24V, 27V, 48V $120.00 $132.00 . PPS-200-v, 200W pcb v = 5V, 12V, 15V, 24V, 48V $150.00 $165.00 . EPP-200-v, 200W pcb v = 12V, 15V, 24V, 27V, 48V $120.00 $132.00 . EPP-300-v, 300W pcb v = 12V, 15V, 24V, 27V, 48V $160.00 $176.00 . EPP-400-v, 400W pcb v = 12V, 15V, 24V, 27V, 36V, 48V $180.00 $198.00 . EPP-500-v, 500W pcb v = 12V, 15V, 24V, 27V, 36V, 48V p.o.a. p.o.a. new! *A range of plates, brackets and clips are available to mount the MSP (HRP) metal caged supplies - click here. The PCB power supplies may also be mounted on DIN Rail using the DRP-02, DRP-03 or DRP-04 clips. Diagnostic Equipment: Patient imaging, CT scanners, ultrasound. Medical Monitoring: Blood pressure monitor, ECG, EEG. Patient Home Care: Automated bed, CPAP, infusion pump. Non-Medical: networking, telecom, consumer electronics. Medical devices are classified as Type B, Type BF or Type CF according to the nature of the device and the type of contact. Each classification has differing requirements from the point of view of protection against electrical shock. Type CF (Cardiac Floating) is the most stringent classification, being required for those applications where the applied part is in direct conductive contact with the heart or other applications as considered necessary. Type BF (Body Floating) is less stringent than CF, and is generally for devices that have conductive contact with the patient, or having medium or long term contact with the patient. Type B (Body) is the least stringent classification, and is used for applied parts that are generally not conductive and can be immediately released from the patient. Type B applied parts may be connected to earth, while Type BF and CF are 'floating' and must be separated from earth. The other form of classification is the MOP (Means Of Protection). This can be 1 x MOOP (single Means Of Operator Protection) or 2 x MOOP (double). And 1 x MOPP (single Means Of Patient Protection) or 2 x MOPP (double). These classifications dictate the isolation voltage, creepage and insulation requirements. The 'Mean Time Between Failure' or MTBF is calculated according to the probability of accidental device failures, and indicates reliability of devices. Therefore, it does not necessarily represent a life of the product. The life expectancy or life cycle of a power supply is most dependent on the electrolytic capacitors used. The deterioration speed of the electrolytic capacitor varies considerably according to the ambient temperature. Generally the speed follows �Rule of Two for every 10�C�; for every 10�C increase in temperature the rate of degradation doubles according to Arrhenius�s equation. The reason Meanwell have such good MTBF specs on in-line or laptop style power supplies is that they use 105�C electrolytic capacitors whereas others use ordinary 85�C caps (open that 'cheap' unit and take a look). Finally, 2017 figures on the '2 year field return rate' suggest that around 1 in 6600 units is ever returned due to faulty parts or workmanship (that's x6 less returns in 10 years). Procon Technology can honestly say, until 2018*, due to Meanwell's extensive burn-in testing, that we have NEVER had a D.O.A (Dead on arrival) nor premature failure of a Meanwell power supply (I wish all the products we sold were like this). The only unit we have had returned within 12 months of installation had a "zapped" nest of ants in it! p.s. We recommend that all power supplies be checked on a regular basis and steps taken to ensure vermin (ants, rats, birds) do not cause mischief! In outside applications, where this could be a problem, we recommend the use of a IP65 or IP67 rated units. e.g. HLG or HEP range. NOTE: An additional method of calculating the MTBF, the Telcordia/Bellcore SR-332, is given on the MSP-1000. This is considered a more accurate method of determining the MTBF then MIL-HDBK-217 for commercial products. Mean Well Enterprises Co., Ltd. is one of the leading switching power supply manufacturers in Taiwan or ROC. Established in 1982, it is a TQM (Total Quality Management) company and has been ISO-9001 certified since 1994. 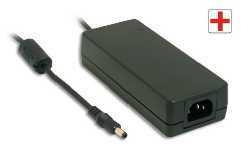 Besides the Industrial AC to DC power supplies, the product line also includes; mains adapters, LED power supplies and drivers, DC-DC converters, DC-AC inverters and battery chargers. Total Quality Assurance and Customer Satisfaction� are the central goals of MeanWell. They and Procon Technology believe that the industry is one where reliability, functionality and cost are of great importance, but that it is reliability that differentiates the truly superior product. So, every product in the Mean Well range is the result of rigid procedures governing design, Design Verification Test (DVT), Design Quality Test (DQT), component selection, pilot-run production, and mass production. To this end, Mean Well have recently implemented a new and highly efficient Computerized Management System (CMS). This system allows improved administration of sales, manufacturing, purchasing, fabrication management, shipping, customer service, and quality analysis, allowing them to ensure the best CQTS (Cost, Quality, Delivery & Service) for customers. The goal is to offer total solutions that satisfy customer's requirements. Mean Well have earned their good reputation based on the quality, competitive prices and punctual delivery of products. This reputation has enabled Mean Well to enjoy an average of 28% sales growth in the past few years. For the company profile - click here. 'Mean Well' may be a name that is unfamilar to you. Perhaps you have purchased the one of the brandnames below? These are often large companies that supply a wide range of electronic equipment, whereas Mean Well specialize in power supplies... or power related products only! Many of these brandnames may, in fact, have their power supplies manufactured by Mean Well. Some of them simply rebadge the MeanWell product and sell it for significantly more! As for the name itself 'Mean Well' or 'MW' should stand for 'Manufactured Well' but the name, which was translated from Chinese, means more than it's dictionary definition - 'to have good intentions'. It may, or may not, surprise you that Mean Well Enterprises has adopted Confucius Analects as part of its corporate culture, 'Honesty and Sincerely', 'Active and Responsible' and 'Harmony and Unity'. The message from the President (Mr Jerry Lin) illustrates the importance the company places on the operation of a humble power supply - "If the CPU is the brain of a system, the power supply is it's heart, and often the value of losses incurred in a single failure can exceed the value of the power supply itself." Note, Meanwell has been awarded the 'Taiwan Superior Brands' title for 2010... and many items have been awarded the "Taiwan Excellence Product Award". Procon Technology is happy to provide any in-stock power supply to government, semi-government or large Australian company 'on-approval' for evaluation and testing over 30 days. Remember OEM, wholesale or re-seller and quantity discounts are available. It doesn't matter whether you are using; ABB, Aros, Absopulse, Agilent (HP or Hewlett-Packard), Allen-Bradley, Altech Corp, Amtex, Astec, Astrodyne, Bel, Block, Cabac, Cabur, Calex, Cosel, EA (Elektro-Automatik), Excelsys, HiTek, IMO, Lascar, Mitsubishi, Multicorp, MuRata, Omron, Phoenix Contact, Powerbox, Power-one, Puls, Rhino, RS Components, Siemens, Snaptec, Sola HD, Statronics, SunPower, TDK-Lambda, Telemecanique, Traco Power, Weidmuller Ecoline or XP industrial power supplies, I'm sure we can find something on the Mean Well range to replace it at a more cost-effective price without compromising quality or reliability! Telephone us on 03 98306288 or email us with your requirements. Note, that some of these 'big name' brands only provide a 1 year warranty. Meanwell provides a miniumum of 3 years with medical units and with the MSP series - 5 years!!! Equivalent part numbers to Meanwell: Contact Procon Technology for equivalents! Disclaimer: The above specifications are subject to change without notice. Please ensure the suitability of these products for your application before purchase. In applications where mains surges may occur (e.g. due to lighting strike) additional protective devices should be fitted... such as the Meanwell SPD-20-240P. Further note that the power supplies with open terminals are intended to be installed inside a "suitable" protective encloser with adequate ventilation provided. They must be installed by a qualified person according to local electrical authority regulations. Please contact us should you have any doubt.